Special thank you to CleverMade for collaborating with me and sponsoring this post. Also thank you Arla Creations for collaborating by sending the personalized bag. As always all thoughts and opinions are 100% my own. Everything I share related back to something going on in my life. Right now I have a friend and she’s pregnant with her first child. Midway through her pregnancy she started having back pains and one night when she felt much worse… her husband rushed her to the ER. They found out that she has MS, Transverse Myelitis to be exact. What does this mean for her? Now she’s been moved to a therapy center and has been working on building strength to get in and out of her wheelchair. Yes, she’s been left paralyzed from her navel down due to this version of MS. The hope is she’ll walk again, but until then she’s working very hard to build strength in her upper body & gain independence in her current condition. I went to visit her in the hospital and brought some of her favorite treats. The room was very tight and there wasn’t much room for the things I brought. (Similar to a hospital room new moms a squished into with their new baby and family.) My friend is now in a rehab facility and the room is much more spacious. I’m pulling a gift basket together and wanted to share what I’m packing and some general ideas for you all. These ideas are great for visiting new moms or girlfriends such as mine in the hospital. I mean, obviously we need to put the goodies in something. Might as well make it reusable right? Weather your friend is in a small or large room it’s nice to have the option to create less clutter. So first one the list is a Clever Made basket. Why this brand? They make many style baskets that fold down flat, in seconds. This allows your friend to reuse the basket when needed. This could be at the hospital, maybe when they pack up, bringing things home. 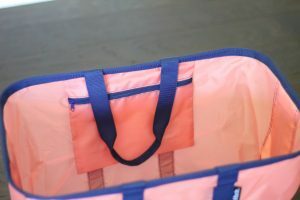 Also these baskets are great for going to the beach, the pool, keeping in the back of your car to carry in groceries and to even use on picnics. They are super multipurpose and that’s why I think it’s one of the best gifts you can give. So before you buy a regular gift bag… consider these. Shop Clever Made here! 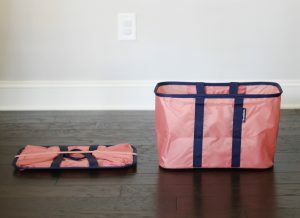 We love these bags to keep in the car for groceries too! They are a multipurpose must have. While your buddy is stuck up in bed, there may be some free time for online shopping. Help them out with gift card to their favorite shops. Some of my favorite mom shops are: PinkBlush, Banky Girl Creations, Copper Two and Mom Life Must Haves. The hospital gives you one, but it’s not pretty. 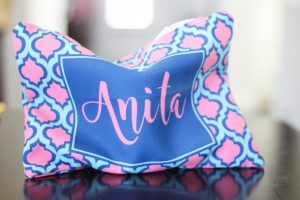 Snag a pretty tumbler or water bottle in your friends favorite color, a pattern you know they would love or customize it with their name. Let’s be honest, we could all start drinking more water! 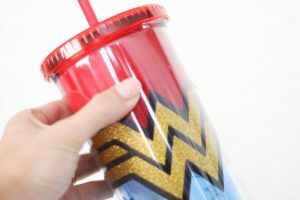 In this case I found a perfect Wonder Woman tumbler! Because my friend is seriously Wonder Woman & handling her new condition of Transverse myelitis like a boss while pregnant! 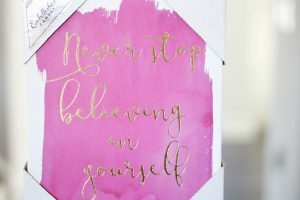 You can always find a fun sign or a sweet card that can sit in your friends room and give them a sense of love. For my friend I wanted encouraging words as she pushes herself to build strength in her new found state of being paralyzed from the navel down. If you get art and it comes with protective covers, leave those on. It may be cute to have it off, but think… they have to haul this home. 5. Lots & Lots of Tissue Paper! 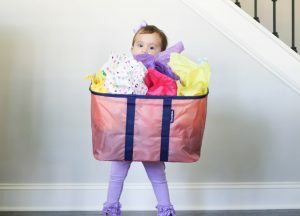 Brighten up your basket with colorful pieces of tissue paper and make the search for goodies more fun! Shop Clever Made bags here! When my friend was first in the hospital getting diagnosed I brought her a big basket full of her favorite foods and snacks. She’s on a slightly restricted diet now. But she thoroughly enjoyed the goodies. 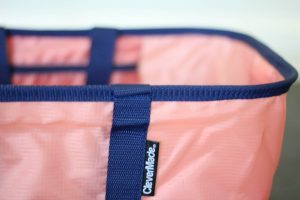 A little zip up cosmetic bag is perfect for more than makeup. Vitamins, hair ties, deodorant and more can be kept in these personalized bags. I hope you have a wonderful time putting your gift basket together. This is all about showing someone you care & that you are thinking about them. From a new mom standpoint… new mommies get so many gifts for babies and not much for themselves. I highly suggest you think about bringing one of these to the hospital or to their home when you visit. As for my friend. I’ll be taking the hour drive with my toddler to visit her in rehab and gift her with goodies I know will make her smile. Love those pop up tote baskets! I’m all about saving space when not in use. This is so sweet! And I hope your friend feels better soon! what a great idea! love that bag too! This is such a great idea, you are such a thoughtful friend! The best hospital gift basket! Such a great idea! I know just who I want to make one for! You are such a thoughtful friend! What a great basket!